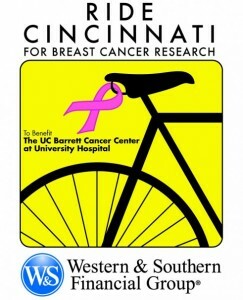 Ride Cincinnati is a local group bringing together cyclists of all ages and abilities for a one-day biking event that raises money for breast cancer research. They have been organizing this day of family fun for four years now and this year promises to be better than ever. 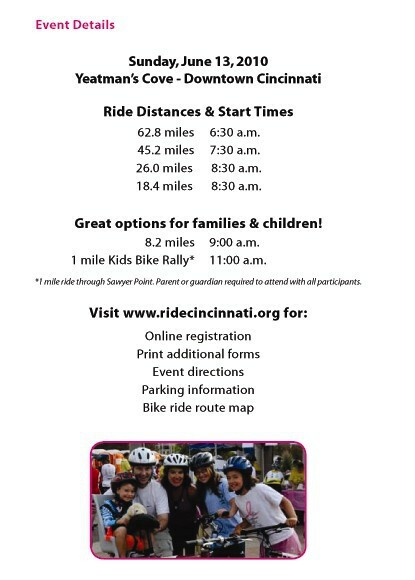 Ride Cincinnati is the first of its kind in Greater Cincinnati, founded in 2007 by Dr. Harvey Harris as a tribute to Marlene Harris and everyone who have been and continue to be affected by breast cancer. Sadly, all of us can name someone whose life has been changed, if not cut short by this disease. The rides are non-competitive and come in a variety of distances – 62.8 miles (wow-za! ); 45.2; 18.4 and 8.2 miles. 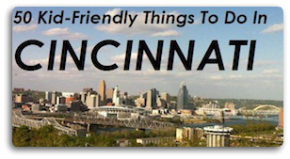 So all levels of cycling can find a fit just right for them, all while enjoying the scenic routes through gorgeous Cincy. I just love this time of year, don’t you? But what I’m excited about is their 1 mile kids ride! P is just now mastering her tricycle, so this will be a ton of fun for her. Plus, after the ride through Sawyer Point, there is a all-out kids party to celebrate under the Purple People Bridge. Bouncey houses, face painting, clowns…your basic toddler paradise, eh? So visit their site and check it out – this might be just the family friendly fun you are looking for…and all for a very special cause so close to us all! Photos highlighted in this post were borrowed from Ride Cincinnati’s site and Facebook page.